If your true love is anything that spells Chevy or has a Bow Tie, look at these. 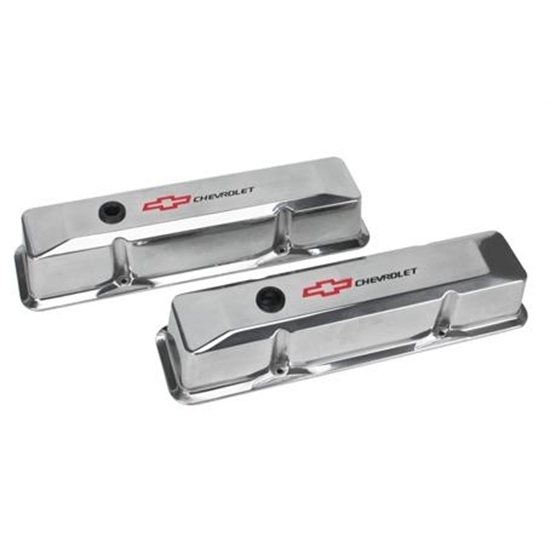 These polished aluminum valve covers fit 1960-1986 S/B Chevys and are made to GM specs. They feature OEM style baffles and dippers. Available with or without the Chevy Bow Tie. These valve covers have built-in breather baffles. Two grommets are included, one for a stock PCV valve, one for a breather cap like our 910-11033. Valve cover depth is 3-9/16". One 1-1/4" push-in hole per cover. Suggested bolt length is 1-1/4".